A gentle ambience designed to free the soul from entanglements and bring you to a place of oneness & healing, empowered to step forward. 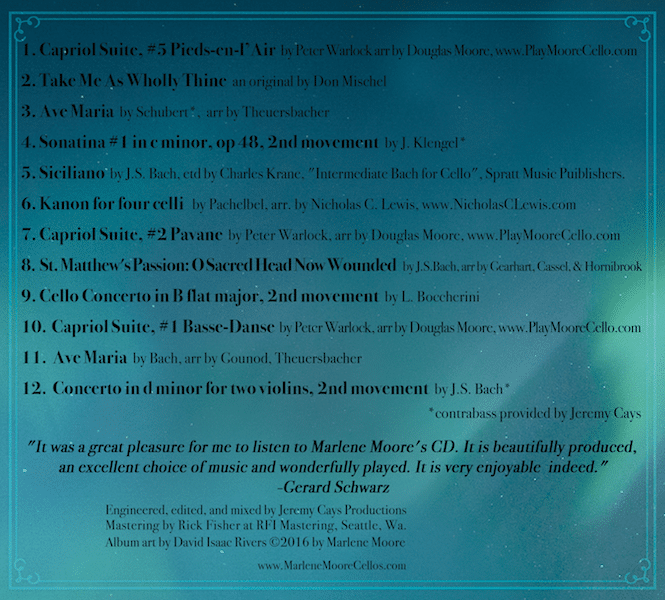 It was a great pleasure for me to listen to Marlene Moore’s CD. It is beautifully produced, excellent choice of music and wonderfully played. It is very enjoyable indeed. 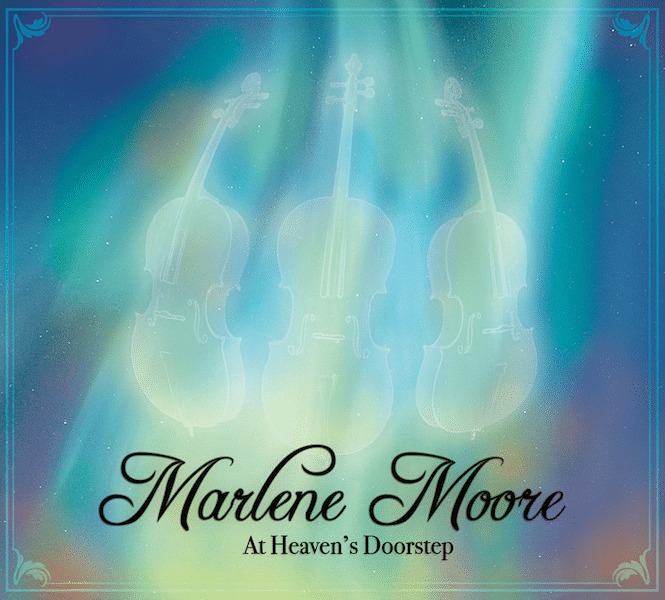 Marlene weaves a rich tapestry with her full, rich cello tones that is totally mesmerizing. A soothing musical journey of exquisite melodies to inspire your spirit and soul. Marlene Moore offers cello lessons to all ages, young and young-at-heart, in a way that has the student’s best interest in mind. 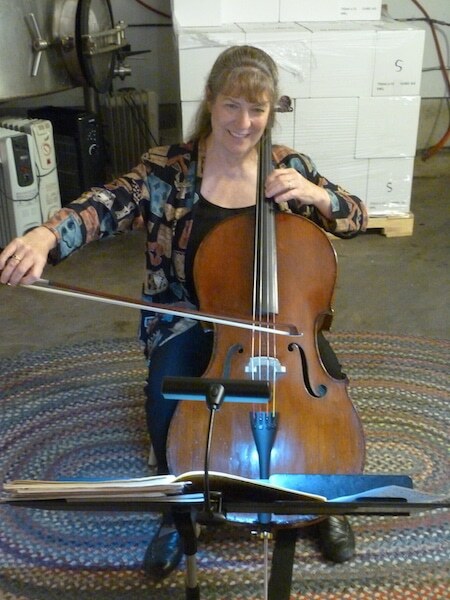 Marlene’s cello studio is in Port Angeles, WA. Lessons are hourly, once a week, Monday-Friday. Tuition fees are reasonable. Marlene expects a commitment to practicing and musical growth, and in exchange applies creative ways to inspire practicing. Email Marlene Now to Get Started! Marlene have over 50 years of performance on the cello and has been teaching cello lessons privately since 1987. She loves teaching students of all skills and ages. Her students range from 4 yrs old to retired and are a source of great inspiration. Her greatest joy is to help students reach their goals in an encouraging setting designed to meet their learning styles. As a private cello instructor of several of my high school and middle school cello students, I was able to observe the positive results of Marlene’s teaching. Many of these students eventually represented the North Olympic Peninsula at the Washington State Solo Contest. Marlene has high expectations and challenges her students to strive to meet these expectations. She does this by teaching the proper techniques, helping the student discover advanced fingerings and bowings, and then positively reinforces and encourages the student. It is without reservation that I recommend Marlene Moore as a music instructor, chamber music coach, and cello teacher. Her contribution to the orchestral music program at Port Angeles High School, Port Angeles, Washington has been significant. Looking for beautiful cello music for your event? Marlene has extensive experience and will professionally bring to you beautiful music. Since she was 4 years old, Marlene has been adding class and music to weddings, memorial services, church services, retirement parties, dinner parties and stage productions. 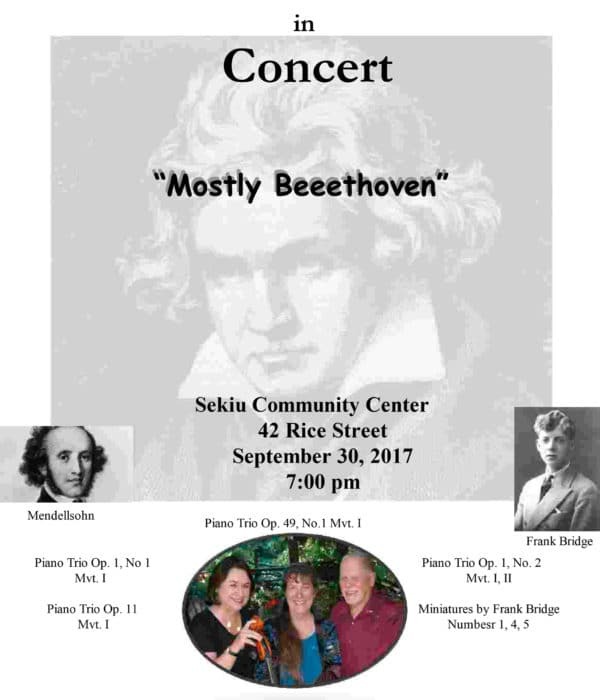 She has been an upstanding member of the Port Angeles Symphony Orchestra and Port Angeles Symphony Chamber Orchestra for years. Since 1998, Marlene has been volunteering to play in Port Angeles Light Opera Association (PALOA) productions including: My Fair Lady, Hello Dolly, Camelot, Annie, The King and I. In 2014, Marlene performed as the solo cellist for Port Angeles Community Playhouse 2-week production of The Elephant Man. Cellist Marlene Moore is an unusual combination of rich, passionate sound supported by the technique to provide a wide range of tonal color. She is a tiny package who puts out a powerful sound that is elegant and thoughtfully conceived causing one’s imagination to see glimpses of beauty and peace seldom contemplated. The smile, the confidence built on musicianship, hard work and tone – many of the same traits as a young person from years past named Jacqueline. That’s the one! Marlene is happiest when sharing her love of music with all of us. Born in Europe to traveling musicians, she grew up in a household surrounded by evening musical soirees. Her earliest memories are of straining to listen through the heating grate to the musical adventures occurring in her family’s living room downstairs. When she and her sister were three and two, their mother engaged two nuns at a convent in Seattle to instruct the girls in the Suzuki Method. In those days, nuns wore full habits and she was terrified of their appearance for some time before her desire to experience music overcame her fear. As the family grew, they developed the repertoire and a following and were engaged most weekends providing church, wedding, and funeral music all over Puget Sound. This experience prepared her for a life devoted to musical performance and teaching and she has played on several continents and several orchestras. 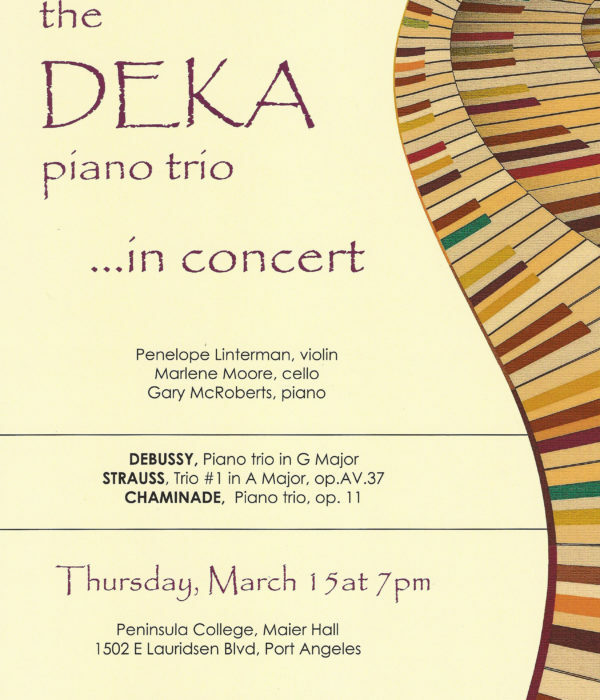 A resident of Joyce, Washington, she is past and presently involved with numerous local ensembles (Moore-Ahmann Duo, Ecclectic Duo, Moore-Lin Duo, The Dungeness Piano Trio, The Deka Piano Trio, former member of The Port Angeles Symphony Orchestra) as well as maintaining a private teaching studio. Anyone who knows Marlene knows that she pours her soul into her music and that her soul is supported by active faith in God.